This was touched on earlier, in the Ash Wednesday blog. “Giving up things” and “denying ourselves” are all recognized forms of Lenten sacrifices. These in and of themselves are noble, difficult and well-meaning. But if we look at them closely, aren’t we focusing primarily on ourselves? I will give up cigarettes. (It is also good for me to do so.) I will cut back on cake and candy. (It is also good for me to do so.) I will diet and lose some weight. (This is definitely good for me.) I am not saying that we shouldn’t do these things. I am just pointing out that the beneficiary is….ourselves. The Pope points out that we must engender giving, which is the capacity to share. What are we sharing if we give up things that we would normally be giving to ourselves? Before we leave this area, it would be wrong for us not to mention that we are saving money from not buying cigarettes, not buying cake and candy. If we then use these acts of denial as a means to obtain something of value that we can give away, that we can share with people in need, then there can be merit in these actions. What is possibly the most precious thing that we have? Think about it. If we are thinking along lines of material things, we are looking the wrong way. Not to turn this into a guessing game, let’s just point out that our life and all that makes it noble is probably our most precious possession. Our mind, our ability to love, our desire to help, and our willingness to go out of our way for another and many more selfless acts dignify humanity. The time that we have, the strength that we have, the awareness and willingness to serve others these are all ways to engender giving. While we are doing any of these, we do not have the spotlight on ourselves. We are focused solely on the other person as being the beneficiary. Presumably, we know that such and such an action is needed, maybe desperately needed, by the person. 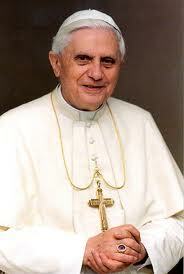 Pope Benedict points out that selfishness is the root of violence. This may sound like a harsh sentence, but think about it. It is the person who thinks of him or herself before others; will put his or her needs ahead of anything else; who covets what others have; who prizes his or her possessions above people, this is the selfishness of which the Pope speaks. Because, if we feel this way, if we think this is true, then any action is seen justifiable to reach these goals. Lying, slandering, stealing, even killing will be seen as justified in our twisted view. Selfishness is truly the root of violence. The call to being a giving person, a caring person is being once again laid before us this Lenten season. It is not to be practiced and then forgotten once Easter is celebrated. Lent is a time to practice our goals, to test out what we can and can’t do. We may stumble. We may trip up every day. Some of the goals may seem to be set too high. But we are not expected to be saints on earth. We are expected to try and after falling, try again. While we are trying, some people who we meet along the way will get the benefit of those efforts. Lent is a time to begin practicing the love that we will have for the rest of our lives.